In an example of currency futures trading, I have shorted the Canadian Dollar. I executed the trade at 11:59 (my time) at a price of 1.0226. As always, I have placed a protective stop in case of bad analysis or any reason that the market may move against my position. Tomorrow, we are going to have an FOMC announcement. It seems as though people are anticipating some type of announcement relating to quantative easing. Also, Ben Bernanke is going to make some kind of speech. I expect that this will have a strong effect on all currency markets, so I will be very vigilant regarding my position, and I will be adjusting my stop accordingly very quickly if price moves in my favor at all. In addition to these announcements, there is also some type of Swiss announcement that, depending on its content, could affect the overnight currency markets. Again, I am mitigating the risk posed by this occurrence with stops. In addition to the technical analysis featured below, and the fundamental factors of the announcements, there is another fundamental factor influencing my decision to seek a short trade in this market. Let us observe the daily trading chart for the December CAD/USD futures contract. Here we can clearly see strong new highs have been made, and we can see that the MACD is diverging with price both with the moving averages and the histogram. In addition, the MACD histogram has "ticked down" upon today's close. This is a positive sign that perhaps a top has been set to this specific upward dynamic. Let us take a closer look by using the 60 minute chart for the December CAD/USD. In this chart we see another MACD divergence. 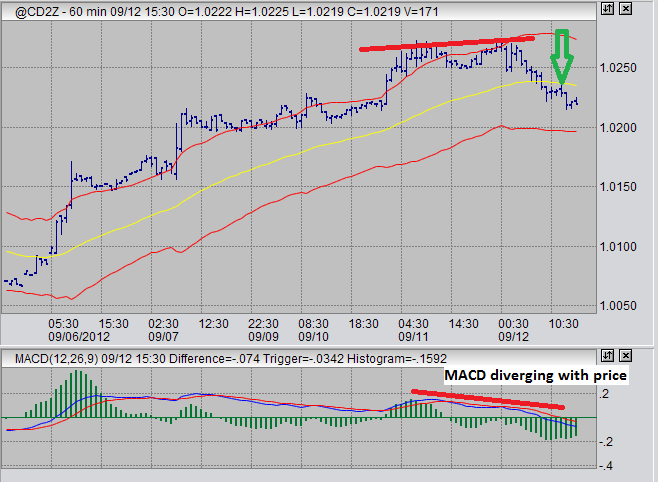 This MACD - price divergence also occurs in both the MACD moving averages and the histogram. In the case of this trade, the divergence occured, and price moved below the price moving average that I have set. You can see price return to the moving average from below, as it is indicated by a green arrow. It was at this green arrow where I made my short sell entry. Ideally, I am hoping for a return to the weekly moving average I have set that is currently around 1.000. Hopefully, the FOMC, Bernanke, and Swiss announcements will induce this to occur. If not, I have my stop loss order to prevent severe losses. In other markets, I am still keeping my eye on the US dollar index for a long trade. This CAD trade is pretty much the inverse of a long DX trade. I like the short setup on the dollar better than I like the technical setup on the USDX right now. I am still looking for a long entry into sugar, but it continues to elude me. I hope the recent gains are short lived and prices drop to recent lows creating a new divergence entry over the next few days/weeks. If not, and prices continue their rise, then I guess I missed out. I am still waiting and hoping for gold to return to the weekly moving average I have set. However, I don't anticipate this very soon. I am still watching natural gas, tomorrow is inventory statement and I expect we will see a short term top and then a return to the mid-high $2 range, but we'll see. I don't have any other trades on right now, just the Canadian Dollar.